As your Tulsa Dentist, Bingham & Howarth Family Dentistry is committed to the health and well‐being of the mouths in our community! As you already know, regular cleanings and checkups are vitally important to maintain healthy teeth and gums. However, in addition to fighting plaque, regular checkups can also help you and your family fight oral cancer. There are an estimated 35,000 cases of oral cancers diagnosed in the United States every year. On average, 60 percent of those with the disease will survive more than five years. • Tobacco use: Smokers are six times more likely than non‐smokers to develop oral cancer. Smokeless tobacco (chewing tobacco) increases the risk of these cancers by about 50 times. • Alcohol use: The combination of tobacco and alcohol can greatly increase risk. • A sore in the mouth that lasts for more than two weeks. 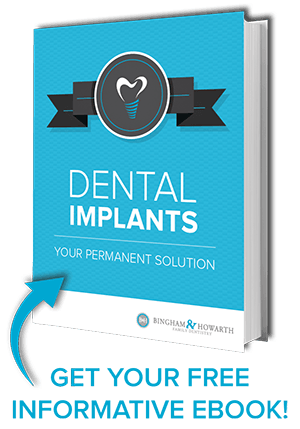 • Persistent pain, numbness, bleeding, or swelling in the mouth. • Lump or thickening in the cheek, gums, lips, or elsewhere in the mouth. • White or red patch on the gums, tongue, tonsil, or elsewhere in the mouth. • Swelling and/or difficulty moving the jaw. While many of these symptoms may not be related to oral cancer, if you’re at higher risk and you experience any of these issues for more than two weeks, discuss them with Drs. Bingham and Howarth right away. An estimated 25% of oral cancer patients have no known risk factors for the disease. Additionally, some patients may have no symptoms. 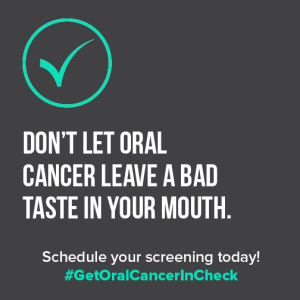 This is why oral cancer screening is so vital. Early detection can result in easier treatment and greater chance for a cure. Step 1: Tongue. We will ask you to extend your tongue as far as it can go so we can examine the sides and underside for white and red patches and/or lumps. Step 2: Lips and Cheek. We will feel for lumps or bumps, looking for white or red areas that should not be there. Step 3: Double‐Digit Probe. Using two fingers, we examine the floor of your mouth, feeling for lumps, and looking for white and red patches. Step 4: Palate. We check the roof of your mouth for lumps, areas of softness on the hard palate, and white and red patches. Step 5: Neck. We feel your neck for enlarged lymph nodes, which could indicate infection. Step 6: Tonsils. Using a dental mirror, we thoroughly examine your tonsils for enlargement, redness, and/or bumps. If you smoke or use chewing tobacco, the best way to prevent this deadly cancer is to quit. For assistance quitting, visit http://smokefree.gov. Performing a self‐examination regularly increases the chance of identifying changes or new growths early. If you spot anything unusual in your mouth or if you persistently experience any of the symptoms listed above, contact us right away. Additionally, keeping up with regular cleanings can help you stay in tune with the overall health of your teeth, gums, and mouth as a whole. Schedule your next appointment with your Tulsa Dentist today at (918) 481-4925!